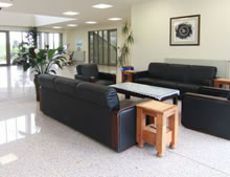 Waihi Academy is a learning and conference centre located in Golden Valley Waihi, and is an ideal venue for school camps, business conferences, retreats and events. Situated among the scenic and peaceful rolling hills of rural Waihi, Waihi Academy offers the chance for a relaxing getaway to recharge and get the most out of the time spent together with your friends and colleagues. We have excellent accommodation facilities, on-site catering, free parking, and a diverse range of rooms and learning spaces which can be utilised. We can cater and host up to 240 people (split between two dorms) in a safe and peaceful environment. Our vast six-hectare site includes a large indoor activity area, outdoor courts, fields and bushwalks with beach access. We have great modern facilities, exceptional food catering and friendly staff, which will leave you with a positive and enlightening experience! For more information, please visit our website or contact us today.